Olympia, Wash. – The Evergreen State College accomplished something Saturday night that it hadn't been able to achieve in five previous five-set Cascade Collegiate conference matches this season. Down two sets to visiting Oregon Tech (9-14 overall, 7-11 CCC), the Geoducks (9-17, 6-12) fought back in front of a raucous crowd to hand the Owls a 14-25, 22-25, 25-21, 25-22, 15-10 defeat inside Costantino Recreation Center. Prior to tonight's match, the Geoducks had lost all five of their previous five-set conference matches, four of them coming to teams either ranked or receiving votes in the NAIA top 25 national poll. After Oregon Tech had rolled in the first set with a .565 attack percentage, including three kills in as many attempts by Faryn Case, the second set was much closer before the Owls pulled it out. They got six kills from Chase Bohman and never again trailed after breaking a 9-9 tie. That set, however, gave a glimpse of what was to come. After hitting .242 in the second set, the Geoducks hit .355 and .240 to take the next two sets and force a fifth. Evergreen built a 12-7 lead on a Chloee Hunt kill in the third set, and it maintained at least a three-point lead the rest of the way. Hunt had five kills and no errors on eight attempts during the set. There was only one tie and one lead change in the fourth set as the hosts raced out to a 12-6 advantage, capped by a Bethanie Nelson finish. 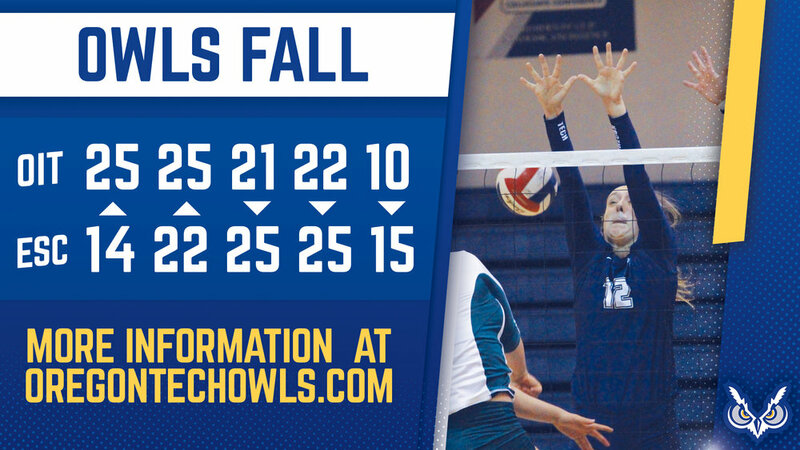 The Geoducks led 23-18 when the Owls put together one last surge, cutting their deficit to 23-22 on a Bohman kill after an Evergreen timeout. The Geoducks stopped the rally and closed out the set on kills by Taylor and Hunt. Nelson had six kills and no errors on nine attempts in the set. Neither team hit particularly well in the fifth set – Oregon Tech at .038 and Evergreen at .091 – but the Geoducks held the momentum and were able to build a 9-3 lead, enough to hold off the Owls and earn the win. Cheyenne Baird, who with senior teammate Matisse Davis was honored prior to the start of the match, finished with a season-high 25 digs, while Ashtyn Bagby led the setters with 39 assists. Top hitters for the Geoducks were Nelson with 17 kills and Taylor with 16, and Hunt was outstanding at the net with two solo blocks and four block assists. Oregon Tech got 21 kills from Bohman, 14 more from Cheyanne Laber and 51 assists from Jaime Toedtemeier, while Paige Bruce led five players in double-figure digs with 18. Oregon tech will return home next Friday and Saturday to host Northwest Christian University and No. 15 Corban University respectively.